An MMS labeled ‘Offen!’ late in the evening …. Last week at the Amsterdam Toool meeting Jos and I experimented with the so called ‘Gemini make up key’ (also called ‘the gemini egg’). It is the round object in the upper right corner of the image. We came quite far opening lock 26 of our competition. But ‘quite far’ does not count, only a real opening does. Last night I received an MMS message from Jos with the title ‘Offen!’, showing he finally managed to open the Gemini at the Toool Eindhoven meeting. And end up with a working key …. This entry was posted on Wednesday, April 29th, 2009 at 08:44 and is filed under Uncategorized. You can follow any responses to this entry through the RSS 2.0 feed. You can leave a response, or trackback from your own site. Actually Walter was the first to open the Gemini in just over one hour. After playing around for several nights with another Gemini (with key) I got from Barry, I learned to understand how to interpret the feedback I got from the lock. Decoding the outer pins proved to be not that hard, after which the inner pint could be set in a rather straightforward way as they don’t have mushrooms. Last night was my first serious go on the actual competition lock. Because I now know the code of the key, redoing it should be a matter of minutes. But as this has nothing to do with picking/decoding (but just setting the “egg”) I don’t think this should count for competition points. Are you sure the key code contained a #3 pin? And did the presence of this #3 pin make picking much more difficult? It does not matter what pin it is,you can feel when to stop pushing the outerpin in,after setting the outerpins you can feel what innerpin you have to set first.Then the shield opens a bit,this probably means it still hangs on a pin,after pushing the shield up a bit it will open. @mh: nope, not at all. mh: I think that the pin #3 makes it much more difficult to manually pick the lock (like using a toothpick to set the pins). But once you have a tool that will keep all pins in place the #3 pin does not help. I received some more info on the lock btw: it contains three mushroom pins (! ), as well as at least one outer pin depth 1, 2 and 3. From what I have been told this is the latest generation Gemini lock. Yes, it was interesting. I opened the lock in somewhat over an hour, but in that time I also learned how to read the pin positions, using both the competition lock as well as another lock that had a fitting key with it. I did not have much picking experience on the lock form before (I’d say half an hour in total max). Reading the depth of the outer pins proved to be rather straightforward, although I found different values using different kinds of tension. I used the most consistent value I found for each outer pin. The inner pins were a bit harder, requiring the outer pin to be in the correct position. I pushed the inner and outer pin at the same time, using the back of a finger pick. I read the values by the naked eye and set them on the tool also using the naked eye (well – I did use another key to get some reference heights). The two inner pins on the bottem I could not read well, so I tried all possible combinations. In this case, there were only few possibilities. Apparantly, there is a reasonable amount of tolerance in the lock. But still it felt good to open it! If the mushroom pins still have the same shape like those that I have seen before, they actually help decoding. But of course you would need a variable setup key to make use of the information gained from decoding, because they make manual picking a pain. 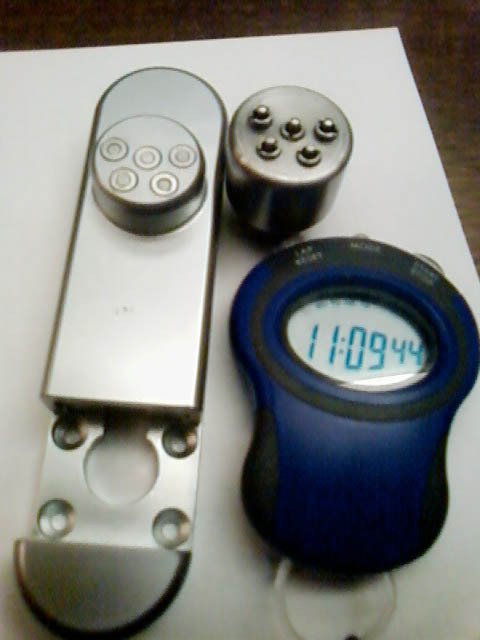 Walter: I did find that the lock I tried had very tight tolerances, and setting a variable setup key to just slightly wrong heights would not work at all. My order was outer pins first, then inner pins. If you clearly feel an inner pin set, then the corresponding outer pin is very likely correct as well. Entries (RSS) and Comments (RSS). 52 queries. 0.387 seconds.